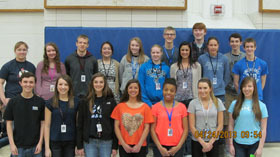 These are the students that are being recognized for April. These students exemplified the four main requirements; Effective Leadership, High Character, Good Citizenship, and a Drive for Excellence. Senior Ava Clarke was nominated by Ms. Glathar and is being recognized for the Spartan Challenge. Ava was nominated because she has proven to be a true Ambassador of Goodwill for all students during her first year as an East High Ambassador. She has been particularly interested in the East exchange students and volunteers for every activity we’ve had for those students. She reaches out in her own time to help others. Ava has volunteered to do the hard work of editing the video that the group of Ambassadors is creating to welcome new students. Also pictured, Ms. Bishara (far left). 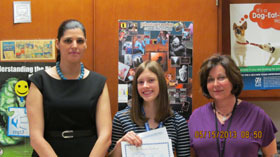 Junior Liza Christensen was nominated by Ms. Keep and is being recognized for the Spartan Challenge. Liza was nominated because she does everything with dedication, skill, and thoughtfulness. She does not speak or act negatively towards anyone. She is honest and provides leadership to groups of students without imposing her ideas on anyone. Liza treats everyone with respect and always sees the positive side. Also pictured, Mr. Jiles and Ms. Bishara (far right). 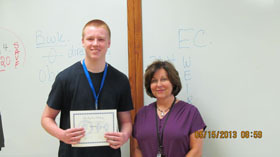 Sophomore Tyler Grof was nominated by Ms. Glathar and is being recognized for the Spartan Challenge. Tyler was nominated because this is his first year as an East Ambassador and he has done an awesome job. He has an easy going manner that helps make new students feel comfortable. He has put a lot of effort helping to create a video to welcome our new students in grades 10-11. Tyler will continue to grow in his leadership capacity and provide a great source of encouragement to new students. 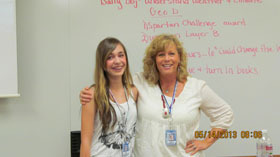 Freshman Alana Sesow was nominated by Ms. Graulty and is being recognized for the Spartan Challenge. 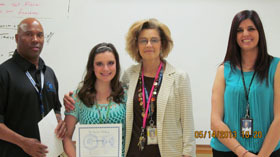 Alana was nominated because she’s respectful not only towards teachers but students as well. She leads by setting the example for others to follow. She’s an incredible athlete and role model. Alana is an all around great student. These are the students that were recognized for the 12-13 school year. We would like to thank Make Coins for providing us with the East High School Challenge Coins and the Nebraska Army National Guard for providing us with The Spartan Challenge posters. The Spartan Challenge Program would not have been successful without their generous contribution. The security and safety of the students, staff and visitors to East High School will be the primary focus of the Security Department. Security personnel will strive to maintain a professional climate with open lines of communication. The members of the Security Department will work together and with other departments and institutions to ensure a high quality of service. The Security Department may be comprised of members from separate and distinct agencies and respect will be given to policies and practices set forth by those bodies. Any Lab Test Now Link for families to use for drug screening. CRIME STOPPERS is a helpful link for people to use and report issues. Drug Identifyer This website assists people with identifying prescription or over the counter drugs. Lincoln Council on Alcoholism and Drugs, inc. Promoting healthy lifestyles free from the aduse of alcohol, tabacco, and other drugs. SCHOOL COMMUNITY INTERVENTION PROGRAM (SCIP) works with Lincoln Public Schools to intervene on behalf of youth at risk for drug and alcohol abuse and mental health concerns.